Classic designs are known for their luxury and elegance. They are still the first choice for so many people because of its luxury, details, strength and vintage feeling. You can’t maintain the classic interior design unless all the pieces harmoniously combine well together, starting from furniture to the gypsum ceiling in gold or white or other solid colors, and decorated walls in addition to the marble or tile floor. Handmade carvings on the furniture are what distinguishes this style which is made of beech, oak, and mahogany. The inscriptions are covered with chips of French gold and painted with silver. This style is known for warm colors such as wine red, white and black as in living rooms and in guest rooms, you can place sofas of golden vintage color, or light blue with gold, or Eggplant purple with yellow color. Velvet fabric is preferable for a more luxurious look. The elegance of the classic style is complete when you mix white, black and gold colors. In a large reception hall, you see wooden carved chairs with gold decoration and winged angels, long sofas of 6 or 8 legs, with carved tables made of beech, oak, and mahogany covered with chips of the French gold and can be painted with silver. ALGEDRA’s designers advise you to use fabrics of warm colors such as red, wine red etc. You can choose sofas in olive color or mahogany red or blue and gold. Silk and velvet fabrics are preferable for a more elegant and luxurious look. ALGEDRA’s designers also suggest you use heritage style accessories that are rich in details such as paintings with plants and nature drawings that have golden frames, the living room is decorated with chandeliers with crystal pieces dropping down from it/ Place some hidden yellow lights that will increase the beauty of the place and table lamps on tables that are distributed in the corners. The walls might be decorated with gypsum inscriptions and a wallpaper that fits with the furniture, or use a suitable wall painting with calm comfortable colors. It is preferable to use a hidden illumination, table lamps and spot lights for wall paintings. The room doesn't have to have high illumination. Curtains must be of thick fabrics or velvet and a little bit longer than floor length. 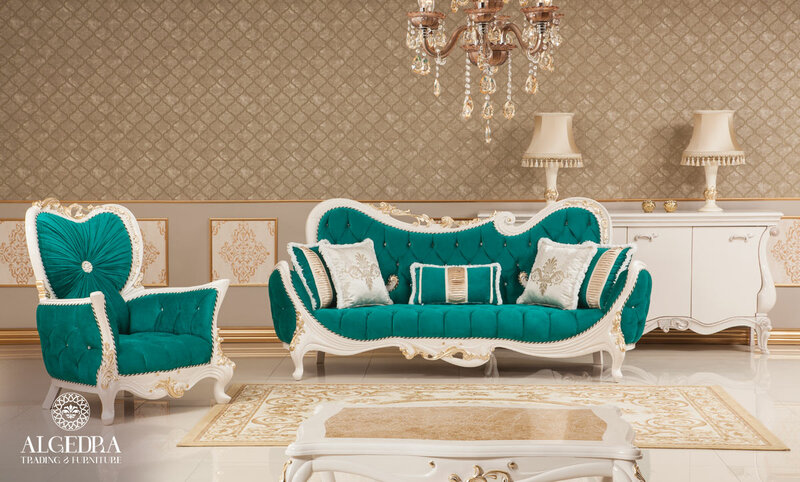 In the living room, you find antiques, vintage furniture, souvenirs, luxuriating fabrics and inscriptions, elegant patterns, silk curtains, and woven carpets with attractive colors and detailed lines to complete the classic style look. To create the atmosphere of the classic design, ALGEDRA’s designers advice you to use elegant pieces of furniture in elegant soft colors, and a group of classical paintings, in addition to pieces of furniture that have multi-uses and shapes to suit the house decor. The position of the TV is very important because it usually determines the center of the living room and according to its position we distribute the other pieces of furniture such as sofas, chairs, and tables. Illumination is usually from chandeliers that are luxurious and elegant with side illuminations like the table lamps, patterned wallpapers and colored carpets, and the use of pillows made of fabrics such as satin, silk, and velvet that are distributed anywhere on sofas, coaches or even the floor. Classic design rooms are distinguished for their elegance and luxury. The classic style bedroom is inspired by the roman and Greek civilization, the elegant Victorian style and the ottoman civilization. The original classic room has beautiful views as well. Large furniture pieces and a spacious center and an internal corridor to the bathroom or the wardrobe. It doesn't matter if some of this stuff are missing. A high bed with patterns and carved wood is distinguished for its elegance and beauty. The room look is completed with accessories such as a comedienne on both sides of the bed, and large cabinets, large carpets in a plain color or decorated with colored chiffon strips, velvet curtains and bed covers that fit with the curtains. What distinguishes the classic design is the harmony between colors and the special artistic details in furniture pieces that give it the classical style that fits with the walls, floor, ceiling, and illumination.